Factor Funding Co., a Houston-based factoring company, announces the unveiling of its new website. The site is intended to serve as an information resource for business owners and integrates social media, a blog, downloadable content and other media. Factor Funding Company is always striving to assure their customers are able to make informed financial decisions. Factor Funding Company announces the redesign of its website and the addition of new resources centered around cash flow management and business finance. The new site is built to educate business owners about the invoice factoring process as well as take advantage of new channels like social media. The new, content rich site offers a variety of educational resources. Small business owners can browse the site for information, fill out applications and qualify for financing without leaving the comfort of their workplace or picking up the phone. The new website showcases Factor Funding Company’s comprehensive services and specialties including invoice factoring, purchase order funding, equipment finance, asset based loans, merchant cash advances, settlement funding and transportation/freight bill funding. 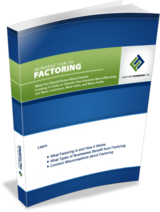 The new site features a wide range of business owner resources including a free downloadable “Intro to Factoring” whitepaper detailing every facet of the factoring process. The Factor Funding blog offers useful information on a variety of financial topics. Factor Funding Company is a Houston-based small business funding service and a leader in helping young and growing businesses including start-ups, minority and women-owned companies to meet cash flow needs. Factor Funding Co provides fast and reliable cash flow solutions to manufacturers, wholesalers, distributors, service companies and a host of other industries through creative funding techniques that will enables them to extend terms to new and existing customers to sell more, deliver more and improve their bottom line.